Promoting the law of war, enhancing accountability, and expanding training and education for militaries and civilians. Helping to prepare the next generation's military and civilian leaders. Partnering to promote military and civilian engagement and enhanced discourse on international law. Working with US and other militaries on cutting-edge law of war issues. 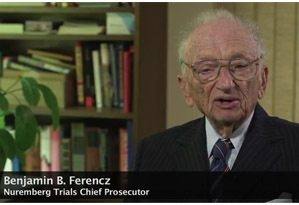 The International Humanitarian Law Clinic works directly with international tribunals, militaries, non-government organizations, and other entities to enhance protections during wartime and ensure accountability for war crimes, genocide, and crimes against humanity. Students in the IHL Clinic work on the front lines—researching ways to hold perpetrators accountable, working on detainee cases and other issues in the “war on terror,” and partnering with the US military on strategies for enhanced education and training in the law of armed conflict. Students talk about their work with the International Humanitarian Law Clinic and the programs and organizations they assisted. Laurie Blank and Gregory P. Noone; includes teacher’s manual. A resource manual on training for militaries in the law of armed conflict. The IHL Clinic addresses difficult legal questions, including the implementation of the law of armed conflict in specific conflicts around the world, the status of specific crimes under the laws of war, the application of the law of armed conflict to cyberwarfare and other new technologies, the legal framework for the use of targeted killing and drones, and legal obligations governing the release and transfer of detainees. The Clinic also directs Law of War Training: Resources for Military and Civilian Leaders, a multi-year project on training for militaries in the law of armed conflict, in partnership with the US Institute of Peace; and Rules of War/Tools of War, a multinational project focused on the legal challenges of complex stability operations. The IHL Clinic provides direct assistance to organizations working to protect civilians in conflict areas, prevent atrocities, and hold perpetrators of atrocities accountable. Students work in real time with international criminal tribunals and human rights organizations, helping prosecute or defend individuals accused of war crimes, raise public awareness of atrocities, and ensure the protection of civilians and combatants in conflict regions around the world. Effective and comprehensive training and education is critical for the protection of civilians and soldiers and effective mission accomplishment. In addition to working directly with the US military on education and training in the law of armed conflict, the IHL Clinic partners with the US Institute of Peace to research and analyze military training programs in countries around the world. The IHL Clinic also works with the International Committee of the Red Cross to develop teaching supplements for faculty teaching IHL and related topics. Law of War Training: Resources for Military and Civilian Leaders is a resource manual on training for militaries in the law of armed conflict. Countries around the world can reference the manual to help ensure that their military forces are trained in the laws of war in accordance with the obligations set forth in the Geneva Conventions and, if they do not currently have such training, can use it in initiating law of war training for their own militaries. Countries can submit the appropriate information for the manual through the secure online survey link, which includes questions about training for national militaries and foreign bilateral assistance training. In addition, the manual will be continually updated on this website and the information will be available on the searchable database link (coming soon). 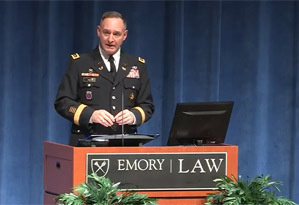 Please direct any questions to lawofwar@law.emory.edu. Purpose: To explore the relationship between existing international legal norms and the planning, execution, and oversight of military operations in the complex contemporary threat environment and to assess whether existing law produces legal and operational uncertainty at the intersection of mission, law and policy. The IHL Clinic initiated the Rules of War/Tools of War project – formerly called “Mind the Gap” – to assess the legal and operational complexities inherent in complicated conflicts, stability operations, and humanitarian assistance operations. The intersecting legal frameworks applicable during these situations pose nuanced challenges for both military and civilian actors tasked with promoting the rule of law. In particular, a lack of clarity can produce complexity and challenges in several key operational areas: detention; targeting and limitations on the use of force; civil-military relations; and the parameters of the authority and responsibility for conducting operations. Understanding this complex suite of issues is fundamental to promoting the rule of law in conflict and post-conflict environments. Provide an operational matrix that can be used as a tool for actors in peace and stability operations to more accurately assess their legal obligations and duties in a given context. Emory Law's International Humanitarian Law (IHL) Clinic hosts Teaching International Humanitarian Law workshops in partnership with the International Committee of the Red Cross. Intended as a teaching tool for law professors, the Teaching IHL workshops guide participants in developing stand-alone IHL courses, integrating IHL modules into their curricula, or revamping current teaching methods of IHL. The workshops provide an opportunity for law faculty to think creatively about their teaching of IHL and to network with others to support and expand their teaching of IHL topics. In conjunction with the Teaching IHL workshops, the IHL Clinic and the International Committee of the Red Cross partner to produce Teaching IHL supplements, which offer materials for faculty interested in incorporating IHL into other courses, such as International Law, International Criminal Law, National Security Law, Human Rights, and a variety of other topics. Each supplement includes analysis, suggestions for cases and materials to use in class, and discussion questions and suggested answers. The International Humanitarian Law Clinic is open to second- and third-year law students. Students will be assigned to work with one or more organizations (international tribunals, non-governmental organizations, militaries, and others) during the semester and will work directly with the attorneys at that organization. Clinic students engage in a wide range of complex and sophisticated legal research and writing on relevant humanitarian law topics under the direct supervision of Professor Laurie Blank, director of the IHL Clinic. The IHL Clinic has prepared briefs and memoranda for the Special Court for Sierra Leone, the UN Committee Against Torture and the Special Tribunal for Lebanon, and submissions to the European Court of Human Rights and the UN Special Rapporteur on Torture. Clinic students also provide research memoranda on key contemporary topics in international law and armed conflict for NGOs and provide assistance to the US military on the incorporation of international law and the law of armed conflict into training and education programs. For two hours of graded credit, students work a minimum of 100 hours on their assigned clinic projects. Weekly or bi-weekly classroom sessions address fundamental principles of international humanitarian law and topical issues in the application of law of war principles to contemporary conflicts, including counterterrorism operations, treatment of detainees, and the conflict in Afghanistan. Students make two short presentations about their clinic work during the semester as well. The International Humanitarian Law Clinic is open to second- and third-year law students. Past experience or coursework in international law is desirable but not required. “Legitimacy and Law of War Compliance,” at “Challenges of Warfare in Densely Populated Areas,” sponsored by the Institute for National Security Studies and the International Committee of the Red Cross, in Tel Aviv, Israel (December 2, 2014). “Israel-Hamas 2014: War, Law and Legitimacy," Carol Becker Middle East Security Speaker Series, Institute for National Security and Counterterrorism, Syracuse University. Lecture, "End of War," Kennedy School of International Affairs, Brigham Young University (November 13, 2014).